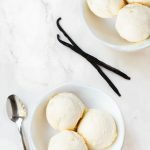 Just like the double berry ice cream I shared with you a few months ago, this vegan vanilla ice cream is intensely creamy. With a deep vanilla bean aroma flavor, it has just a hint of coconut you’d only pick out if you knew you were looking for it. If you don’t do dairy like me, you may be looking for vegan cool treats to eat in the summer. Fortunately, grocery stores now carry a plethora of delicious non-dairy frozen desserts using various plant-based milks. But ever since I purchased my ice cream machine, I’ve been churning my own and the flavor possibilities are endless. 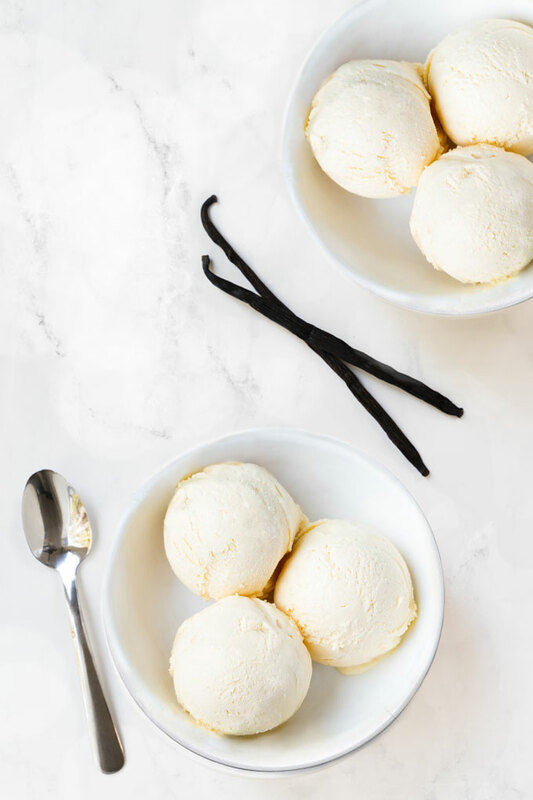 The inspiration for this vegan vanilla ice cream came from Luna & Larry’s Coconut Bliss. The texture and flavor of Coconut Bliss is largely indistinguishable from premium ice cream. It’s smooth, creamy, decadent, and so satisfying. I clearly remember my first Coconut Bliss experience. It was my 26th birthday and Tanner decided to go get supper (so I wouldn’t have to cook). He came home with miso soup, sushi (we both LOVE sushi) and two pints of Coconut Bliss ice cream – Vanilla and Chocolate Peanut Butter. It took us the first spoonful to completely fall in love with Coconut Bliss. If it wasn’t my birthday, I am pretty sure we would have fought over the last bite. The base for this vegan vanilla ice cream consists of coconut milk. Full-fat, creamy coconut milk. Other vegan milk substitutes, like almond milk, rice milk, or even light coconut milk just don’t cut it when it comes to ice cream. You need the fattiness and unctuousness that can only be found in a can of coconut milk. Store-bought non-dairy milks generally have high water content and low fat content, which creates hard, icy crystals when frozen. Now, you might be wondering if the ice cream tastes like coconut. Yes, it does have a hint of coconut, but since I am also using cashews as a base ingredient, I don’t find the ice cream overwhelmingly coconut-y. Cashews are excellent because of their high fat content. Fat influences how ice cream forms a film on the inside of your mouth and how fast it wants to slip down your throat, which influences the delivery of the flavor. You want your ice cream to linger a little and cashews help do just that. Another fat-based ingredient is coconut oil, which helps not only with the overall mouth-feel, but also with slowing down the melting of ice cream. Since we’re making vegan vanilla ice cream, a fresh vanilla bean is a must. While vanilla beans are more expensive than vanilla extract, they have a more intense vanilla flavor. They are the purest form of vanilla. The seeds are not only loaded with flavor, but they also add a visual interest to the ice cream. That being said, pure (alcohol-based) vanilla extract has its place in this recipe as well. Not only does it add more flavor, but the alcohol helps prevent ice crystals. Last but not least, I am using maple syrup as the sweetener, but you can use any sweetener you like. Coconut Bliss uses agave syrup, So Delicious uses dried cane syrup or monk fruit extract, and Dream has brown rice syrup together with agave. I do recommend using a liquid sweetener so it dissolves easily in the cold ingredients. Just like for my vegan berry ice cream, I used an ice cream machine. Churning the ice cream mixture is what creates the fluffiest and creamiest texture. So if you have an ice cream maker, use it! If you don’t, you’ll need to break up the ice cream ice crystals manually as the ice cream mixture freezes. This means pouring the ice cream into a shallow pan, and keep checking on it every 30 minutes after you’ve placed it in the freezer. As the ice cream starts to freeze near the edges, remove it from the freezer and stir it vigorously with a spatula, whisk, or a hand mixer (a hand mixer will give you best results). Really beat it up and break up any frozen sections. Return to freezer. Keep checking periodically and stirring (by hand or with the electric mixer) while the ice cream freezes until completely frozen. It will likely take a few hours to be ready. This vegan vanilla ice cream is intensely creamy, rich, decadent, and so satisfying. With a deep vanilla bean aroma flavor, this ice cream has just a hint of coconut you’d only pick out if you knew you were looking for it. Pour the vanilla ice cream into an ice cream machine and let it churn according to the manufacturer's instructions (the churning should take about 22 minutes). Spoon the churned ice cream into the loaf pan (or a freezer-safe container). The ice cream can be served at this time as soft serve. For firmer ice cream, place plastic wrap, parchment or wax paper directly on top of the ice cream, cover and freeze for a few hours. (The time will depend on how firm you like your ice cream and how deep/shallow your ice cream container is - anywhere from 2-6 hours). The ice cream is ready when it's the desired consistency. For softer ice cream, remove it from the freezer 10 minutes before serving. What is the purpose of the parchment paper in the loaf pan? Hi Danielle, parchment paper prevents getting a layer of ice crystals on top of the ice cream. The idea is similar to storing your ice cream in freezer bags, and just like that, it isn’t going to entirely stop ice crystals over several days of non-usage. But it should slow down the formation of ice crystals and also prevent the ice cream from absorbing freezer odors. Can I use heavy coconut cream instead of full fat coconut milk instead? Or is that the same thing? I love coconut bliss ice cream a d so delicious ice cream as well. I can’t wait to try this. I attempted to make ice cream and was not happy with the results. I will definitely give this a try. I hope you love the recipe, Erica! Oh Petra, you are such a wonderful talent ! All the recipes I try are so tasty, and this one is amazing ! I tried it today, and oh… it is delicious. I followed the recipe step by step, and we loved it. My ice cream making isn’t as good as your and it took me twice as long to have a texture that pleased me, but it really was worth the wait ! Thank you so much for sharing these recipes with us ! but is there a way to make these ice cream recipes without ice cream maker? I was wondering if this icecream can be made without cashews (or any nuts)? Hi Pia, I am not sure if you can make the ice cream nut-free. I have never tried it. However, you can certainly sub the cashews for some other type of nuts. 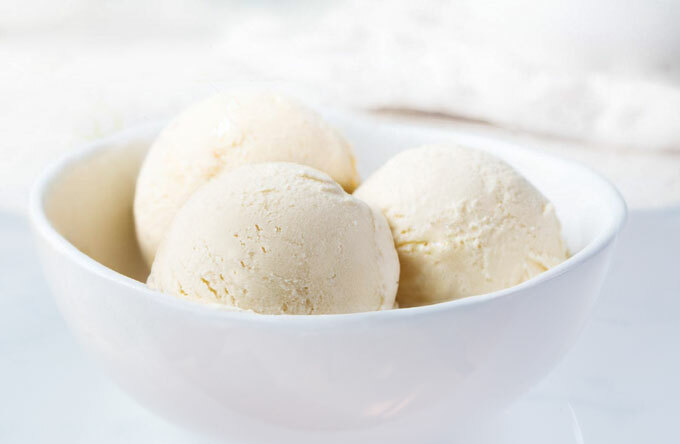 I would recommend light nuts, such as macadamia or blanched almonds to keep the color of the ice cream white/yellow. Hi Petra, I made this recipe is delicious, thank you. But I have a question for you, in the list of ingredients you call for 1/4 cup water, in the video however you don’t use water. So I need to use water or not? Dear Petra, I made the temperd dark chocolate and it was OF COURSE wonderful! Actually it wasn’t my first time to make this kind of chocolate but your recipe is accurate and fully-featured ! I made it with nuts like you and the taste was mmmmmm – difficult to discribe! Amazing! !